English preacher and Hebrew scholar; born at Vache, near Chalfont, St. Giles, Buckinghamshire, in 1540; died at Carwood, Yorkshire, Feb. 26, 1618 or 1619. He was made prebendary of Oxgate, St. Paul's, London, in 1564; and in 1565 master of arts of Oxford, and in the same year a fellow of Merton College. At Bolton Percy Rectory he was made subdean; but after 1579 he turned itinerant preacher. 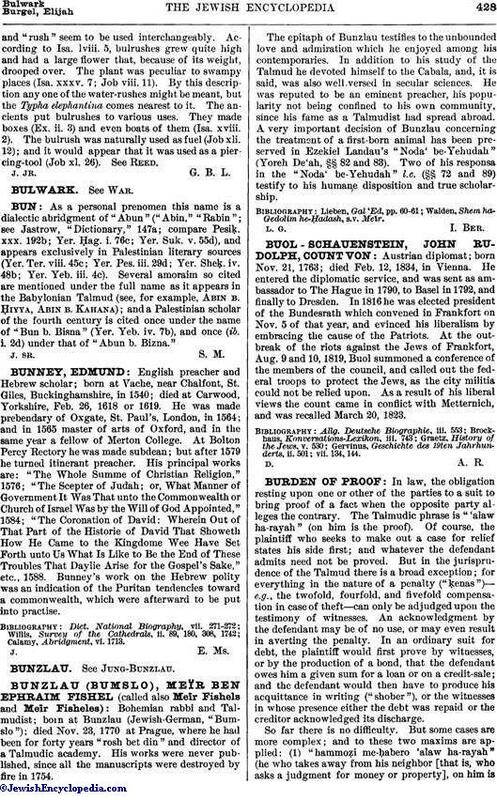 His principal works are: "The Whole Summe of Christian Religion," 1576; "The Scepter of Judah; or, What Manner of Government It Was That unto the Commonwealth or Church of Israel Was by the Will of God Appointed," 1584; "The Coronation of David: Wherein Out of That Part of the Historie of David That Showeth How He Came to the Kingdome Wee Have Set Forth unto Us What Is Like to Be the End of These Troubles That Daylie Arise for the Gospel's Sake," etc., 1588. Bunney's work on the Hebrew polity was an indication of the Puritan tendencies toward a commonwealth, which were afterward to be put into practise.